Lack Of Deep Sleep May Set The Stage For Alzheimer's : Shots - Health News A mouse's brain clears out toxins during periods of deep sleep — including toxins that form the sticky plaques associated with Alzheimer's disease. Could the same hold true for people? Jeffrey Iliff (right) and Bill Rooney, brain scientists at Oregon Health & Science University, look over an MRI. 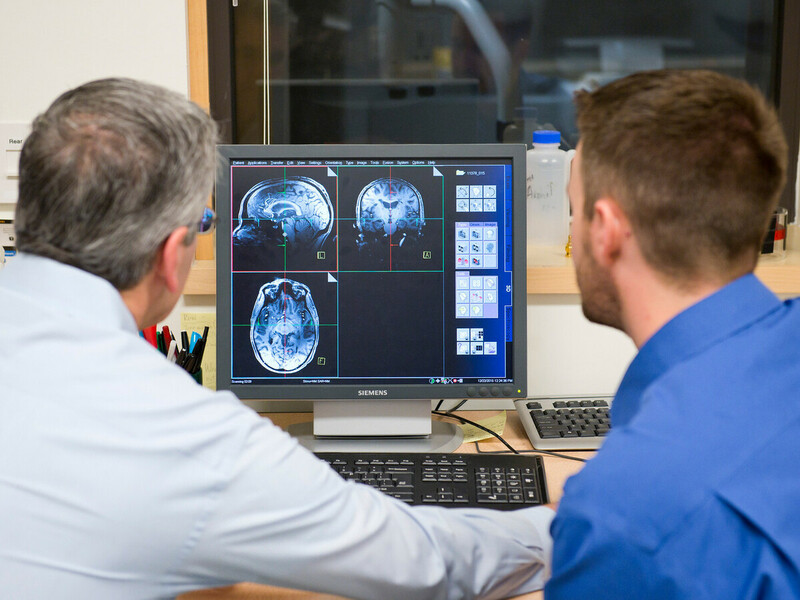 The school has an especially sensitive MRI unit that should be able to detect precisely when during sleep the brain is being cleansed of toxins. There's growing evidence that a lack of sleep can leave the brain vulnerable to Alzheimer's disease. "Changes in sleep habits may actually be setting the stage" for dementia, says Jeffrey Iliff, a brain scientist at Oregon Health & Science University in Portland. 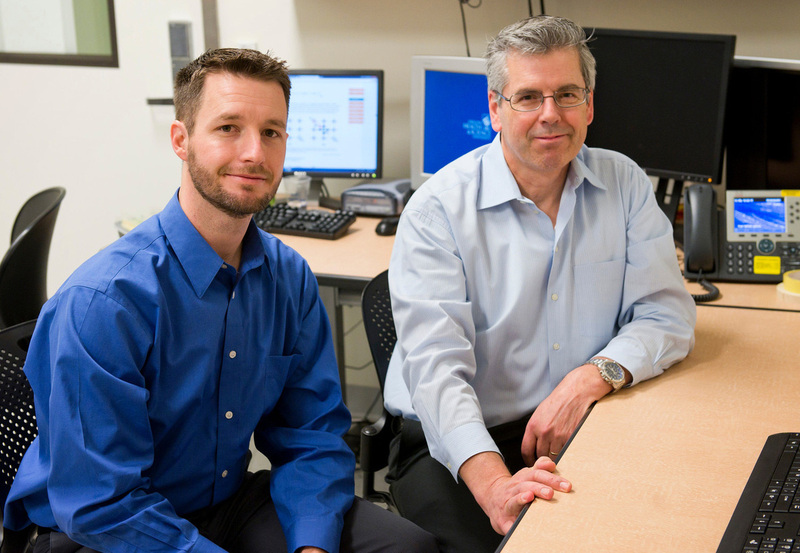 The brain appears to clear out toxins linked to Alzheimer's during sleep, Iliff explains. And, at least among research animals that don't get enough solid shut-eye, those toxins can build up and damage the brain. Iliff and other scientists at OHSU are about to launch a study of people that should clarify the link between sleep problems and Alzheimer's disease in humans. It has been clear for decades that there is some sort of link. Sleep disorders are very common among people with Alzheimer's disease. For a long time, researchers thought this was simply because the disease was "taking out the centers of the brain that are responsible for regulating sleep," Iliff says. But two recent discoveries have suggested the relationship may be more complicated. The first finding emerged in 2009, when researchers at Washington University in St. Louis showed that the sticky amyloid plaques associated with Alzheimer's develop more quickly in the brains of sleep-deprived mice. Then, in 2013, Iliff was a member of a team that discovered how a lack of sleep could be speeding the development of those Alzheimer's plaques: A remarkable cleansing process takes place in the brain during deep sleep, at least in animals. What happens, Iliff says, is "the fluid that's normally on the outside of the brain, cerebrospinal fluid — it's a clean, clear fluid — it actually begins to recirculate back into and through the brain along the outsides of blood vessels." This process, via what's known as the glymphatic system, allows the brain to clear out toxins, including the toxins that form Alzheimer's plaques, Iliff says. "That suggests at least one possible way that disruption in sleep may predispose toward Alzheimer's disease," he says. Jeffrey Iliff (left), a brain scientist at Oregon Health & Science University, has been studying toxin removal in the brains of mice. He'll work with Bill Rooney, director of the university's Advanced Imaging Research Center, to enroll people in a similar study in 2016. To know for sure, though, researchers will have to study this cleansing process in people, which won't be easy. Iliff studied the glymphatic system in living mice by looking through a window created in the skull. The system also involved a powerful laser and state-of-the-art microscope. With people, "we have to find a way to see the same sort of function, but in a way that is going to be reasonably noninvasive and safe," he says. The solution may involve one of the world's most powerful magnetic resonance imaging machines, which sits in a basement at OHSU. 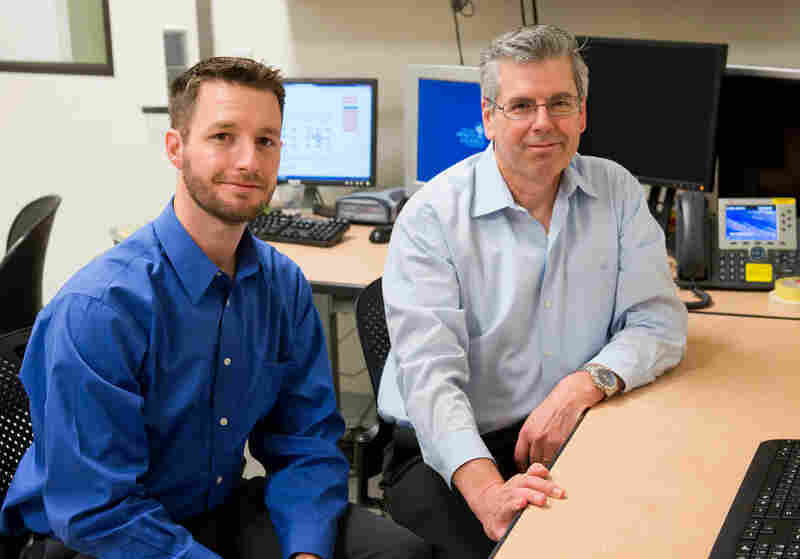 The MRI unit is so sensitive, it should be able to detect changes that indicate precisely when the glymphatic system gets switched on in a person's brain, says Bill Rooney, who directs the university's Advanced Imaging Research Center. When humans enter deep sleep, and toxin removal begins, there should be a particular change in the signal coming from certain salt molecules. That would indicate that fluid has begun moving freely through the brain. In young, healthy brains, the signal should be "robust," Rooney says, indicating that the toxin removal system is working well. In the brains of older people, and those who are likely to develop Alzheimer's, the signal should be weaker. Rooney and Iliff have received funding from the Paul G. Allen Foundation to test their approach. They hope to begin scanning the brains of participants within a year. One challenge, though, will be finding people able to fall asleep in the cramped and noisy tunnel of the magnetic resonance machine. "It's a tricky thing because it's a small space," Rooney says. "But we'll make people as comfortable as possible, and we'll just follow them as they go through these natural stages of sleep." If Rooney and Iliff are right, the experiment will greatly strengthen the argument that a lack of sleep can lead to Alzheimer's disease. It might also provide a way to identify people whose health is at risk because they aren't getting enough deep sleep, and it could pave the way to new treatments. "It could be anything from having people exercise more regularly, or new drugs," Rooney says. "A lot of the sleep aids don't particularly focus on driving people to deep sleep stages."